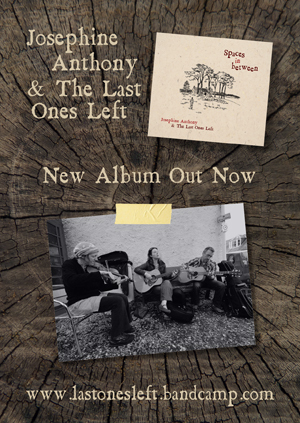 The Last Ones Left are a Glasgow based group performing their own distinctive brand of folk music. The band features Josephine Anthony on vocals and guitar, Craig Whitehill on guitar, and Kathryn O'Neil on fiddle. Josephine writes the band’s original material. She grew up in a musical family and takes a great deal of inspiration from her roots in the Aberdeenshire countryside. She is intrigued by old songs and stories, and by the traces of past lives hidden in museum shelves, historic places and ancient landscapes. Craig and Josephine started out playing as a duo in 2003. They bumped into Kathryn at the Moniaive Folk Festival in 2009 and promptly brought her into the fold. The band is always very happy to have their sound compared to the likes of Sandy Denny, Nick Drake, Bert Jansch and Joni Mitchell. However, they believe strongly in putting their own distinctive take on everything they do. Josephine can also be heard from time to time singing with her brother ‘Rick Redbeard’.